Kraken tattoo is a mythical sea creature that was believed to have the power to sink enormous ships. This animal can be found in the Norse Mythology and although it was just a mythical creature, seafarers had many stories about it, and they were always watching out for it. The Kraken is more like a squid or an octopus and so in many of these tattoos you can hardly tell the difference. According to legend, this creature was often spotted off the coast of Greenland. Although it had all the features of an octopus what made it distinguishable is its massive appearance and power. The creature was said to be multiple times bigger than an ordinary octopus, and it was so powerful that it could even sink a ship. Its massive size and power fascinated people so much and soon they started to have different images of the creature inked on them. Besides from the mythical stories about this sea creature its appearance in the Pirates of Caribbean is another thing that made the kraken tattoos popular. Although the meanings of these tattoos vary from one wearer to another most of them are connected to the physical appearance of this creature and its attributes. One of the common meanings of these tattoos is power since the animal was thought to be very powerful. Some people will have the image of a Kraken inked on them to show that they have the power of the creature or at least they believe that they have it in them. This does not necessarily have to be a physical strength, but it can also be an inner strength. 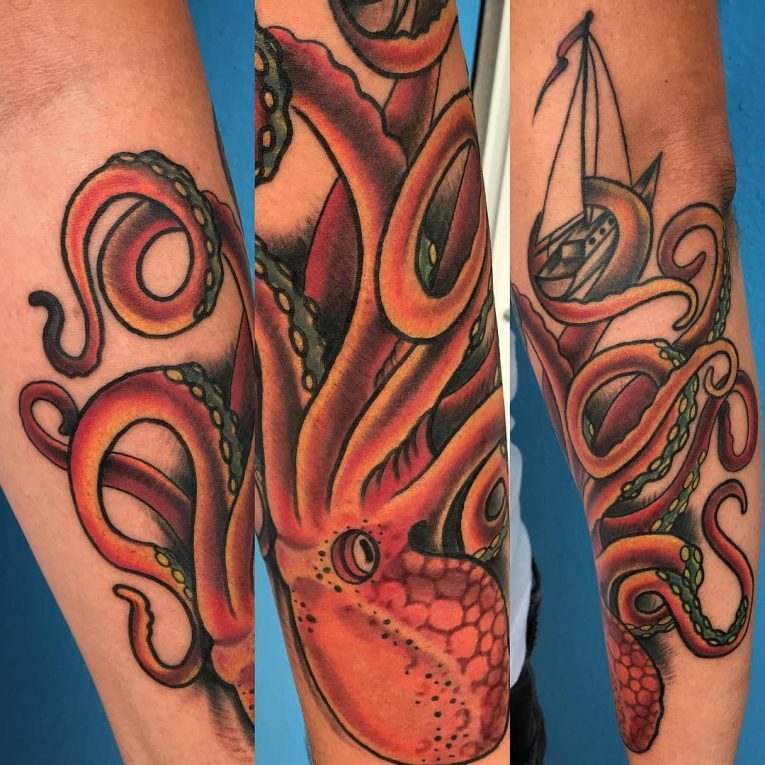 Just like an octopus the Kraken is thought to have the ability to regenerate any lost limbs and so this tattoo can be used to symbolize this in a person’s life. As a human being, it is easy to identify with the whole concept of regrowing and moving forward with life. The Kraken can hold symbolic meaning to those who went through traumatic events in life or a difficult phase and came out with a desire to push on with life. Just like the limbs of a Kraken can grow back so should one’s life continue after a difficult phase. The number 8 is thought to be very symbolic, and different cultures and mystics have revered it for many years. The Kraken takes the shape of a number 8 which is also the symbol for infinity when drawn on its back. Any animal that takes this shape is thought to represent infinity or life without end and in some cultures it is also thought to be a sacred animal. As a tattoo lover, you can have this tattoo inked on you to show the symbolic meaning of the number 8 in your life. You can combine the shape of the creature, and its other attributes to bring out the particular meaning that you wish your tattoo to show. Other meanings that this tattoo can represent include fertility, intelligence, diversity, vision, and diversity. Since the Kraken was basically a big octopus, it is right to assume that it is as fertile as the octopus. The octopus can lay up to 150,000 eggs which shows just how fertile it is and so having this tattoo can be used to show fertility in one’s life. Intelligence is what would make such a creature survive in the unforgiving seas and so if it existed it would likely be very intelligent. Having this tattoo can be a sign that you admire its intelligence or that you are also as smart as the Kraken. Although this tattoo might look a little bit scary it is still a perfect image to have inked on you. To make sure that it maintains all its devilish looks you should have it drawn in all black ink. This tattoo uses the tribal patterns and design in the drawing of the Kraken. The image of the Kraken will not be as eye-catching as the other designs, but the tribal patterns will give your tattoo an amazing look. The Kraken’s were known to use their massive power to sink ships. 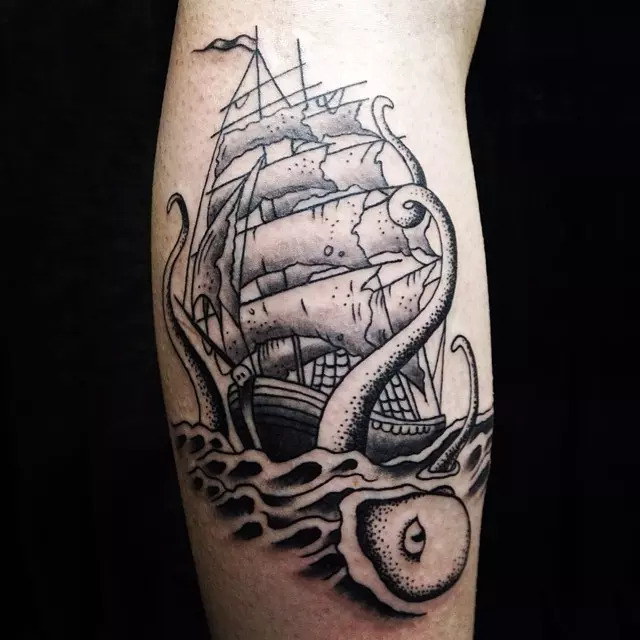 This tattoo is used to show a Kraken sinking a ship, and there are very many ways to draw it. In some tattoos, the creature is drawn wrapping all its tentacles on the ship while in others it can be drawn approaching the ship. Most tattoo artists will tell you that with squid-like animals the bigger the image, the better and so this is the reasoning behind this tattoo. In the tattoo, the Kraken is drawn to cover the entire back, and the tentacles are spread to other parts of the body. In some cases, they can be drawn to come all the way to the chest and stomach or downwards to cover your hips and legs. The sea monster is the most common type of Kraken Tattoo. 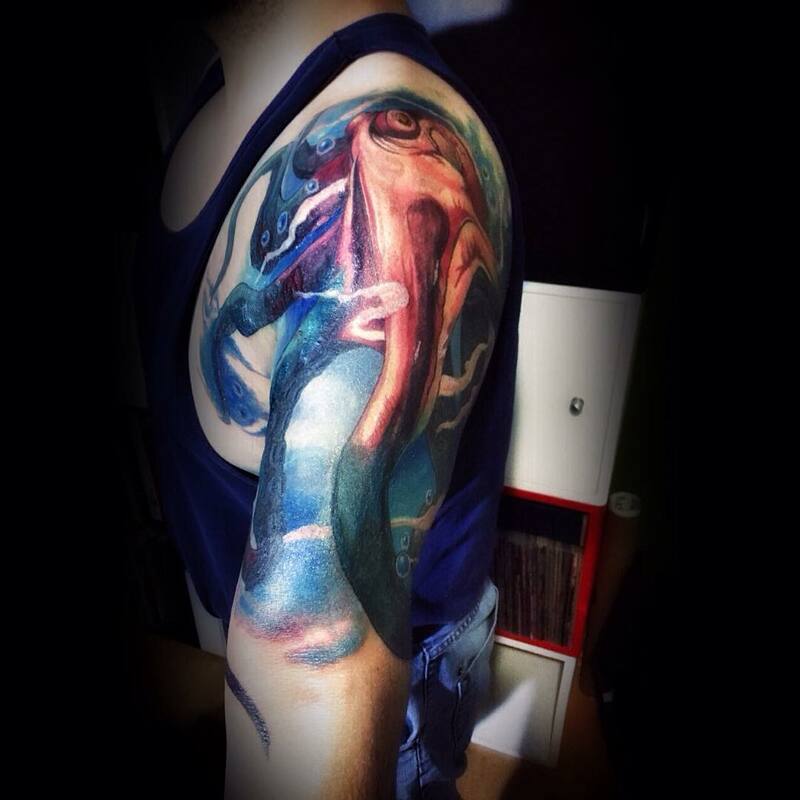 Unlike the other Kraken images that look purely like an octopus, this tattoo looks slightly different. Some people can even draw it with crab-like arms or with fewer tentacles. However, regardless of what features you add or remove the aim should always to preserve that Kraken look and to make your tattoo look fabulous. This is a classic tattoo that shows the Kraken in what can be considered its natural habitat. The tattoo is simpler than most of the other types as it is only made up of an image of the mythical creature swimming in blue waters. However, you can have some additions to make your tattoo more beautiful. For example, it is common for people to add images of other sea creatures like fish in this tattoo. The cartoon Kraken is often portrayed with bulging eyes and a bright magical body. In some images, the tentacles can also be enormous to make the creature more frightening. If you want to have a unique cartoon Kraken you can get some inspiration from comic books. If you have a very skilled tattoo artist then you can get the realistic Kraken tattoos. This requires a very skilled artist as he will have to use a lot of imagination to come up with a tattoo that portrays how the creature would look like in real life.